How can I get a copy of my hotel confirmation? How can I cancel or modify my existing hotel reservation? I need help with my existing reservation. How late can I check in? What if I don't show up? How do I fill out a Best rate guarantee claim? How do I submit a general comment or suggestion? How long will it take Interactive Affiliate Network to respond to my reservation request? I'm looking for a hotel in Los Angeles. Can you help me? Simple! Just click here and enter the information requested. Or just give us a call. You can call us or send us an email using the e-mail form on the left. Although you are guaranteed for late arrival, if you check in after 11:59 p.m. on your assigned check-in date and you have not given notice of a later arrival by phone before that deadline, the hotel may consider your entire reservation as a no-show. Once your reservation has been designated as a no-show your entire reservation will be canceled. Once your reservation has been determined as a no-show it is non-refundable. Call our customer service line if you will arrive late. Please review your reservation confirmation page for hotel-specific cancellation policies. What are your cancellation policies? 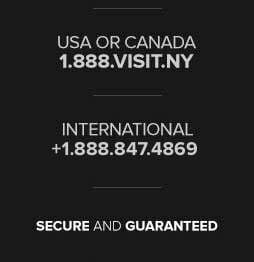 For hotel reservations we NEVER charge you NYC.com change or cancel fees. Other travel sites may charge you a fee to change your plans, but with NYC.com just go online or call 1.888.VISIT.NY to change or cancel your plans at any time. Please note, you may still be subject to change and cancellation fees that the hotel property itself may impose and require us to pass on. For ticketing and tours our cancellation policies differ by the type of product you purchase. All our policies can be found by clicking on the Terms & Conditions link near the bottom of one of our billing information pages. The billing information page is the page where you provide your name and other billing information when making an online purchase. Before filing a claim, you must first read these terms and conditions. Select "General Comment or Suggestion" from the e-mail form on the left and enter the comment or suggestion you have for NYC.com. Your feedback, suggestions and comments are very important to us. Yes. We take this matter very seriously. To ensure your security, Interactive Affiliate Network utilizes a secure commerce server, which encrypts the credit card number and encodes it into a non-usable form. In certain instances, Interactive Affiliate Network can make reservations at sold out properties. Often lodgings identified as "Special Internet Rates" are providing sold out availability. If you want to be placed on a waiting list, you will need to contact the lodging directly. Reservation requests will result in a new screen showing an Itinerary Number, which should be kept and used with any future correspondence with Interactive Affiliate Network. You may also be quoted a Confirmation Number. Additionally, all reservations will be followed up within 2 to 4 hours with an email using the same Itinerary Number and, if available, a Confirmation Number. All reservation requests will result in a new screen showing an Itinerary Number, which should be kept and used with any future correspondence with Interactive Affiliate Network. Additionally, all reservations will be followed up with an email within 2 to 4 hours using the same Itinerary Number with the status of your reservation. Typically, most lodging reservations are made in real time and your confirmation should only take a few seconds. You will be notified of the status of your reservation within 2 to 4 hours. However, there can be delays. In such cases, you will receive an email from us without a confirmation number. When we receive the confirmation number from the property, it will be emailed to you. If there is a special request or rate change associated with your reservation, the request will be sent to a Customer Care agent for processing. You may contact us directly at [email protected]. No. The email confirmation you receive from Interactive Affiliate Network is all you will need. It displays your Interactive Affiliate Network Itinerary Number, the hotel information, the rate, confirmation number, and the hotel's cancellation policy. Use the "View/Cancel Reservation" link provided on the home page. After submitting your reservation request, you will be provided with an email address to use to make inquires about your request. 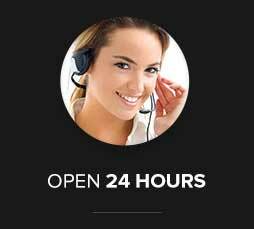 Our qualified and friendly agents are available 24-hours a day, 7 days a week, 365 days a year (including holidays) to answer your questions. All you have to do is ask. Our reservation agents are unable to do individual searches for clients due to our high volume of reservations. Please use the Lodging Search Form to identify availability and rates at over 47,000 hotels around the world. Interactive Affiliate Network strives to provide the best service possible and will work on behalf of our clients to rectify any regrettable circumstances pertaining to your reservation. However, Interactive Affiliate Network acts only as an independent agent to secure services of an air carrier, car rental supplier, hotel, vacation rentals, or other travel related supplier. Therefore, we have no control over personnel, equipment, or operations of these suppliers and shall not be held liable for any inconvenience, personal injury, property damage, or other loss incurred as a result of any wrongful acts, omissions, or default on the part of the suppliers. All grievances must be reported with any and all supporting documentation to Interactive Affiliate Network within 60 days of the mailing of the first credit card statement showing any discrepancies for billing and payment issues or within 60 days after the completion of travel services provided. Special Internet Rate hotel reservations booked through Interactive Affiliate Network are guaranteed to be the lowest rate. If there is a lower rate available for the same dates and the same hotel, you must contact us within 24 hours of booking your "Special Internet Rate" reservation. We will either refund you the difference or cancel the reservations without penalty. This guarantee only applies to rate indicated as "Special Internet Rates." It does not apply to special events such as New Years and the Super Bowl. To learn more or to claim a guarantee, Click here.